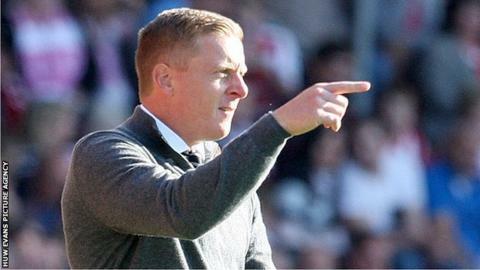 Swansea City Manager Garry Monk says some players' places are "under threat" after four games without a win. The Swans failed to win a match in September and crashed out of the Capital One Cup away at Hull City after an unbeaten first month of the season. Ahead of Sunday's Premier League game against Tottenham at the Liberty Stadium Monk admits he has "difficult decisions" to make. "There are players that are itching to play," he said. "I have a fully fit squad and I will always try and make the best of it when I'm picking a team. "Everyone's positions will be under threat, that's why you have competition in the squad. "The players know that if you don't perform your shirt is available. You have to fight every single day for that shirt." After beating Manchester United and Newcastle and drawing with Chelsea in August, Swansea have picked up just one point from their last four Premier League games, and scored just one goal. It is a run of results that has seen them drop to 11th in the table. Though coy about which players were in line for inclusion, Monk believes an improvement is essential after the 3-1 defeat against Southampton. "I think we all have taken a little bit of criticism in these recent performances, Southampton and Watford, and quite rightly so. "We take that responsibility. We didn't perform as a team, not one player performed at that level and I accept responsibility for that as well. "It's never a lack of commitment or effort. It's just about making sure we get back to a consistent level which was our biggest strength last season. "The group take it as hard as anyone. "The fans are always disappointed losing games but there's no one who hurts more than myself and the players." Swansea have yet to beat Spurs since winning promotion to the Premier League, taking just one point from their eight meetings since 2011. The North Londoners meanwhile have not lost in the Premier League since the opening day defeat at Manchester United.